Google Earth Engine seems to be updated pretty frequently. Towards the end of 2018, I noticed two interesting things – that some of the Sentinel 5P data is now available and that Google is shutting down Fusion Tables. Fusion Tables will be shut down at the start of December 2019, so you have just under a year to migrate any data away. Google seemingly has this habit of shutting down tools. It is pretty frustrating if you have come to rely upon a particular product. However, it does make you consider open source alternatives. I am not sure at the moment if there is a direct comparative open source alternative to Google Earth Engine, but the Open Data Cube is probably the closest. There is a hardware setup cost for this, but it could certainly be managed, the system requirements are here. Is anyone running a small OpenDataCube on a Laptop? I wrote about uploading a .kml file to GEE via fusion tables here. Now, about a year later, the best way to load vector GIS data to GEE is… to import a Shapefile. It is well documented here. These will centre your map on the object London_shp and will add London_shp to the map. If you then print London_shp you will find out that it is a FeatureCollection and has some attributes associated to it. // Export the FeatureCollection to a SHP file. There you go, the alternative to Fusion Tables. I am really excited by Sentinel 5P. I’ve blogged about its importance here and how to access it via Python here. Now we can access it in Google Earth Engine, or at least some of the data in GEE. One of the things that is great about GEE is its ability to handle deep time series and we now have a decent amount of data from Sentinel 5P. 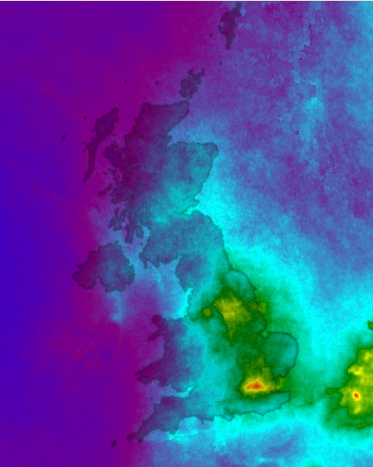 So, let’s have a look at the mean NO2 covering our London Shapefile that we imported previously. Import, change name and centre on the London feature and add it as a layer. Next, add the Sentinel 5P dataset and filter on the NO2 column number density and a date range. It looks like the data is pretty noisy and variable. I am not an atmospheric scientist, so I don’t know why, but there does seem to be a noticeable decrease in late December. Less traffic around Christmas maybe? Both these examples make working with data so easy. I’ve previously described working with GEE as like ordering a sandwich. It still seems to be that way. I’ve added these files to my useful GEE scripts on GitHub, they are here. This entry was tagged fusion tables, Google Earth Engine, Sentinel-5P. Bookmark the permalink.